At last, in 732, the Muslims were defeated at Tours in France, exactly a century after Muhammad’s death. It was a turning point, at least for Europe. Islam had to settle for what is now Spain. In the east, meanwhile, Muslim expansion continued well into the 17th century, engulfing huge swathes of India and of what is now Malaysia and Indonesia. Islam was on the march, right through Central Asia and as far as the borders of China. For five centuries Islam’s supremacy in the Iberian peninsula (Portugal and Spain) grew and was consolidated. Then, in the early 13th century, the “reconquista” got under way, the gradual taking back of the various kingdoms from Islam, and for “Christianity”. The Muslims started to be pushed back from north to south; it took nearly three centuries. Finally, in 1492, the same year in which Columbus reached the “new world”, the year also in which Spain’s Jews had the stark choice of either converting to RC-ism or leaving the country, Islam’s last redoubt, the Alhambra fortress in Granada, surrendered. King Ferdinand and Queen Isabella, who had managed the last stages of the reconquista, and the unification of Spain under their governance, received the proud title of “Reyes Católicos” (Catholic Monarchs) from the pope, a Spaniard himself. In the 14th century Ottoman Turks rose to dominance in the Muslim world. In 1453 they seized the last center of the Byzantine Empire: Constantinople, right on the brink of Europe, renaming it Istanbul. It became their jumping off point for Eastern Europe. 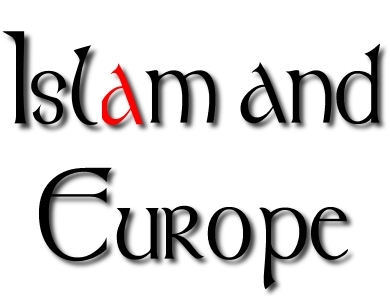 As Islam’s west European chapter was closing, its east European chapter opened. As far as Europe was concerned, it took the Ottoman Empire 230 years to reach the apex of its career. All of the Balkans, including Greece, Bulgaria, Hungary and Romania were under its control. Then, in 1683, on the thresholds of Vienna and Kiev, the empire was “contained”, 950 years after the Muslims’ defeat in France. Inevitably, here too, in Europe’s south east, Islam began to be pushed back. However, it wouldn’t quite suffer the fate that Islam had suffered in Spain. It did lose much territory in the following centuries, but to this day important pockets of Islam are left in the European part of Turkey, in Bulgaria, Albania, Kosova, Bosnia and Macedonia. The 20th century brought staggering changes to Europe; one of these: a new Muslim invasion. This time we are talking of a quiet, a gradual invasion; perhaps we could call it insidious. This invasion, and it is growing even now, dwarfed, and dwarfs, the initial ones. During the best part of half a century the number of Muslims in Europe, not counting Russia, has sharply risen, standing now at close to 13 million (some estimate 15 million). A first generation came ‘invading’; second and third generations were born inside Europe. They didn’t come on horseback, brandishing swords; “Jihad” may not be on the minds of most, but they do swear the same allegiance to Muhammad, the Qur’an and Islam. Europe may have changed, Islam has not. Three of Europe’s key countries have the biggest Muslim communities: 5 million in France (mostly from North Africa), 3.2 million in Germany (mostly from Turkey) and 2 million in Britain (mostly from Pakistan). Exactly two and a half years after 9/11 in New York and Washington, Spain, with a sizable, modern, Muslim population of its own, is rudely introduced to the realities of Islamist terror – nearly 200 dead in Madrid’s railway-stations. A secular newspaper comments that Muslims want to see their ignominious defeat and expulsion in southern Spain in 1492 avenged. Many see the Madrid terrorist attacks as a punishment for Islam’s expulsion when it had been entrenched in the peninsula for nearly 800 years. The Israeli government is fully aware of what is going on and, for better or for worse, they are doing something about it. Whether the Spanish government has any inkling is a matter for debate. But are Christians any clearer? There is no sign that they are really grasping what is going on. One non-Spanish, non-European, mission expert says that if Christians fail to respond to the spread of Islam, it will eventually become the dominant religion throughout Europe. He notes that indigenous Europeans have low birth rates, while many of the immigrant populations that are moving into the region have high birthrates. Therefore, he says, it is only a matter of time before the nations of Western Europe begin to experience a shift in the balance of culture and world view. Is there a tragedy in the making? One may ask whether it is tragic to “lose” Europe to Islam. Seeing Europe effectively turning “I.U.E.” (Islamic Union of Europe) will, indeed, seem a tragic calamity to many. But a far greater tragedy has been in the making for many years: God’s children, i.e. the real Christians, still about in Europe, have been happily oblivious of what is going on! Here God has sent them one of the neediest mission fields right to their doorsteps, but where is the thought, the will, the prayer, leave alone the vision and the initiative, to actively reach out to these Muslims with the saving Gospel of Jesus Christ? Precious time, energy and money are poured into all kinds of things that are at best trivial and at worst harmful. It is the tragedy of redeemed Christians fiddling and frittering their time away, when God means to reach out through them to the followers of a self-described prophet, who walk in the darkness of death and have no idea of the Light of the World, brightly shining in the Gospel of Christ. While Christians “fiddle”, their governments may be busy – with things like Muslim scarves in schools..! Both Christians and governments are a laughingstock to the Islamists. They take the Qur’an seriously. They go for it. They are ready to lay down their lives. Our Lord and Master told us to “occupy till I come”. While Christians may not be able to prevent certain areas of the world coming under the sway of Islam, can they trust God to touch individual Muslim lives through them? Or is it beyond God’s power to have Muslims voluntarily and joyfully surrender to HIM through loving testimony by Christ’s followers? Of course, it is not beyond his power! Yet for such power to flow, He depends on his children to be the channels that He needs. He depends on their readiness. Are you ready?! So what is the tragedy of our making? Our answer? Okay, let’s pray for more workers among the Muslim multitudes around us… As for us, our calling for now is to be really good ‘pew-warmers’, or even ‘pulpit-warmers’. Our answer? Let us be modern Jonahs – knowing and possessing the only viable alternative, the Gospel of Jesus Christ.., and begrudging it the Muslims. 4. The abundance of good materials available to pass on to the Muslims in our towns and cities is staggering: Bibles, NTs, Gospels, Scripture calendars, other literature, CDs, cassettes, etc. And it’s right in their own Arabic, Turkish, Urdu, Farsi, or whatever their mother tongue may be, lacking only distributors. Our answer? It is easier and more convenient for now to play the part of the “priest” and the “Levite” in the parable and quietly pass by on the other side of the road. We’ll leave it up to the occasional ‘Good Samaritan’ to bless the Muslim with these priceless materials. Or, by God’s grace, shall we say YES to Ephesians 6:14-15?